It’s there, right from the start when in Casino Royale we are introduced to James Bond in the casino. 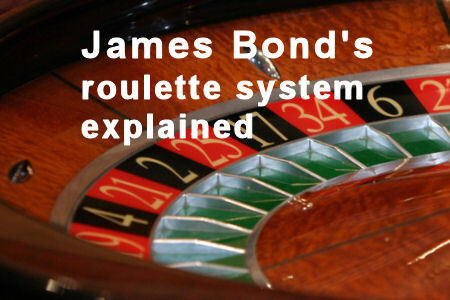 But while he is usually at the card tables 007 also sometimes plays roulette. Here we look at the system he uses according to his author. Prior to facing Le Chiffre at the baccarat tables in Casino Royale, James Bond spends some time playing roulette. 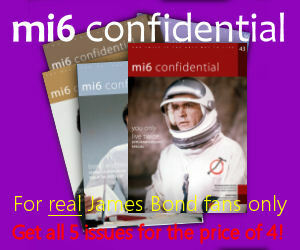 Without detailing Bond’s system Fleming tells us that he uses complicated progression systems on the even chances. While he failed to enlighten us on that occasion Fleming did later describe a progression system in his travelogue series for the Sunday Times, Thrilling Cities (later collected for a book of the same name). 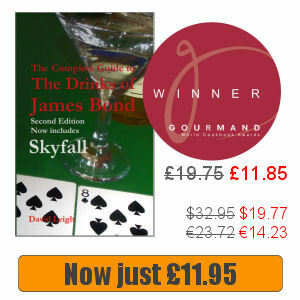 In the chapter on Monte Carlo, Fleming is asked to spill the beans on James Bond’s secret roulette system, which he duly does. Fleming describes it as “the only way of gambling with a capital of ten pounds with a reasonable prospect of making the price of a good dinner”, before going into detail. Bear in mind that he wrote the article in 1960 and so inflation has reduced what that ten pounds can buy you for dinner, but the progression system he describes could easily have been the one used by 007. Change your money into chips of the value of the minimum stake; you need a hundred or so chips. Sit down next to the table opposite the red or black even chance. Write the numbers 1 to 5 on a card. Your first bet, placed on the big red (or black) diamond, is the sum of the top and bottom figures on your card; 5 + 1 = 6 chips. If you win, cross out the 5 and the 1 on the card and then bet the sum of the next two top and bottom numbers; 4 + 2 = 6. If you have one remaining digit then just bet that. Each time you lose, write the amount of your loss at the bottom of your column. Your next bet is the sum of the top and bottom numbers not scratched out on your card. When all the numbers are scratched out your win will amount to the sum of all the numbers in your original five figure column, or worth fifteen chips. At this point you should walk out of the casino. While the outline above uses betting on red or black, the Labouchère system can be used to play any of roulette’s even chances; red/black, odd/even, 1-18/19-36. Since the system only works with even chances it means there is no chance of a big win and while the system won’t guarantee a win, it does provide the player with some advantage. The theory is that because two numbers are crossed off for a win and one number is added for a loss, the player needs to win just 33% of the time. Given that the system is applied to evens only, which pay out at slightly less than fifty percent because the player loses when the zeros come up, this represents a substantial advantage. However, there is a downside. A losing streak results in progressively larger stakes so that table limits may be reached, at which point the system no longer works. It does help extend the amount of time at the wheel until a small amount is won (or you are wiped out), good to help enjoy the experience rather than bankrupting the casino. If you have tried this system in the casino then leave a comment below and let me know how well it worked for you.